Let’s look at the regional variations, and the change in the nature of jobs. The semi-skilled manufacturing jobs that moved to China actually provided a boost to American employment in high-end areas such as the West Coast and New England – because that is where the new technologies have been developed. Jobs did not simply move from the U.S. heartland to China, they moved from some parts of the United States to others – from the Rust Belt to the Sun Belt. They didn’t just move to China, so much as they moved via China – to Americans better able to meet consumer needs in the 21st century. The end product? Better jobs, at better pay, for higher levels of skills and entrepreneurship – encouraging economic efficiency and growth. I think that there are so many factors left out of that calculation that you simply cannot draw that conclusion from the data at hand. Some of those considerations are workers brought in on H-1B visas, other foreign workers, wage stagnation, and that not all jobs are created equal. Let’s begin with that last consideration. When a factory worker loses his or her job earning $45,000 a year plus benefits but gets another job in fast food taking orders and makes $20,000 without benefits, that’s not a parallel move. That worker has actually been injured. Here’s the next consideration. Let’s say 100,000 business services jobs are created in the course of the year and 100,000 initial H-1B visas are issued in that year. That has happened frequently since the “China shock”. That does nothing for the manufacturing workers who’ve lost their jobs but it does increase costs. More people need more housing, more roads, more sewers, more public services of all kinds. The housing boom of the early Aughts did result in some manufacturing workers finding new jobs but many of those jobs were also taken by foreign workers, many of them coming into the country illegally. That probably resulted in some smoothing but didn’t really solve any problems. Many of those workers lost their construction jobs during the late Aughts. The enormous increase in SSDI rolls is corroboration for what I’m pointing out. SSDI is the unemployment insurance of last resort. Finally, hourly earnings of non-supervisory employees have been flat for decades while earnings for top management and protected professional have increased. That’s the breakdown of total national income. That is not what a healthy economy looks like. I’m not opposed to trade or efficiency but that’s not what we’ve seen over the last 20 years. What we’ve seen is Chinese mercantilism. Under a gold standard that might have worked out nonetheless but with our current fiat currency it has mostly resulted in Chinese inflation and American stagnation. Just about every people in every part of world has had a spring festival. Throughout its history Christianity has borrowed and absorbed these into its celebration of Easter, Christianity’s greatest feast. The story of the Resurrection itself has echoes of the Mesopotamian story of Tammuz and Inanna and in the Egyptian story of Osiris and Isis. Giving decorated eggs goes back to the very earliest days of Christianity. Eggs dyed red were given at Easter to symbolize Jesus, the tomb, and his resurrection. Most European countries use some form related to Greek pascha, cognate with Aramaic pascha and Hebrew pesach, for Easter. The earliest attestation of “Easter” of which I am aware is from Bede’s Ecclesiastical History of the English People, c. 731 AD. In it he says that “Easter” is derived from an Anglo-Saxon word for the month of April. It has been said that in turn was derived from the name of a Saxon goddess. We’ll have to take his word for it. The earliest attestations of the Easter Bunny, the Easter analogue of Santa Claus, is from Germany in the 16th century. In the early 19th century Jacob Grimm claimed that the rabbit was a symbol of the Saxon goddess Oestara, something other scholars have repeated. I’ll take his word for it. In Australia, where imported rabbits are pests, a native Australian, the Easter Bilby, has taken over some of the Easter Bunny’s duties. Every Easter I give my wife the best chocolate bunny I can find because a) she likes chocolate; b) a chocolate bunny at Easter is a family custom of hers going back generations; c) I love my wife; and d) I know what’s good for me. Can someone please explain the graph above to me? I don’t think it depicts what its caption says it does. I think its caption says that college tuitions have peaked but the graph itself says that they’ve increased in real terms over the last 25 years. How can you identify a peak if you’re sitting on it? Do my eyes deceive me or, if you fitted straight lines to those two on the chart, would they not have positive slopes? I would also like to a see a restatement in which inflation calculations do not include health care or education. 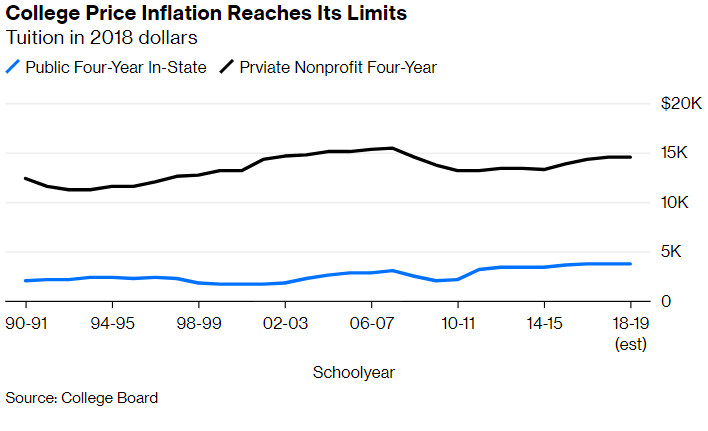 Enrollment at four-year for-profit colleges is in free fall, dropping 13.7 percent from fall 2014 to fall 2015, 14.5 percent the following year, and 7.1 percent the year after that. Perhaps the only surprising thing was that it took this long. For-profit colleges have long been plagued by poor performance — a 2012 study by economists Kevin Lang and Russell Weinstein found no earnings premium from attending a for-profit university. Follow-up studies yielded similar results. But the price tag for these colleges was high, and students were encouraged to take out lots of loans to pay it. The inevitable result was a generation of for-profit college students with poor employment prospects and a mountain of debt. Meanwhile, a whiff of dubious marketing hung about the industry, with DeVry University being forced to pay a $100 million settlement for misleading prospective students about the economic benefits of attending. and the not-for-profit educational industry is trundling along right behind it. As I have been saying for the last 25 years and here on this blog for the last 15, our problem is not that we don’t have enough people with college educations. It’s that we’re not producing enough jobs that require college educations and pay the wages people are expecting to be qualified for with their college educations. I did a little checking not too long ago. The total number of jobs in the United States for reporters and editors for newspapers, magazines, and broadcast is around 75,000 and that’s declining in double digits annually. The journalism and other degree programs are graduating about 14,000 people with journalism degrees annually. There’s a skills mismatch here but it’s not the sort of skills mismatch that can be solved by granting more journalism degrees. The smartphone in India is also sparking earthshaking transformations in private and public life. To hundreds of millions of young and poor Indians, the device offers their first — and exhilaratingly simultaneous — experience of a camera, computer, television, music player, video game, e-reader and the internet. The smartphone compresses a timeline of technological advances that in the West took centuries — from the invention of letterpress printing to the advent of photography, radio, television, personal computer and modem – into just a few years. A social and political revolution accompanied these technological leaps in the West: For instance, a rising middle class empowered by the printing press cracked open the exclusive world of a tiny literati. India today is witnessing an even more drastic shift in class power. Anyone with a smartphone possesses the means to express an opinion and disseminate it far and wide, not only bypassing but also confronting the traditional elite of political representatives, technocrats and opinion makers in the media. The experience offers few reasons to believe that faster communications will encourage greater democracy and freedom globally. Fake news, spread through WhatsApp and Facebook, has already fueled lynch-mob murders in India. It now threatens to influence India’s ongoing general elections just as decisively as it did the Brazilian elections late last year. Smartphone owners are constantly exposed to high volumes of information and disinformation — both of which have a misleadingly uniform digital texture. One obvious result is the weakening of analytic ability — the capacity to distinguish between the essential and the inessential, truth and untruth. And when state education is poor, private education largely a con and competition fierce for even menial jobs, conditions are ripe not for revolution, as Marxists like to believe, but for a mass exodus into the smartphone’s screen. Demagogic politicians adept at social media such as Indian Prime Minister Narendra Modi and Brazilian President Jair Bolsonaro can only benefit when politics blends with entertainment, and campaign commercials as well as Bollywood videos flash forth from the same portable screen. I think that I can reconcile these two apparently conflicting positions. The ease of dissemination of information when every citizen has a sound and video recording device, a library, and a communications device in his or her pocket has simultaneously rendered secrecy virtually impossible, removed the ability of politicians to control the messages that people are hearing, and exposed just how greatly they have been working against the people’s wishes but rather in their own interests. This tool has not created opinions; it has revealed long-held opinions. Here’s a wacky suggestion. If politicians want to be treated like philosopher-kings they damn well should start acting like philosopher-kings, beginning with austerity in their own lives. They can’t hide any more and it will only become more difficult with each passing year. You cannot combat vice with even greater vice. You combat it with virtue and that cannot be faked. Governments that have detailed knowledge of other countries’ motivations and capabilities are likely to be much more circumspect about the sort of rash actions that can lead to war. That’s one reason why North Korea’s opaque regime can seem so alarming, whereas German-U.S. relations survived revelations of Washington eavesdropping on Chancellor Angela Merkel’s cell phone more or less unscathed. In this sense, espionage is just a more shadowy version of the nuclear inspections, Open Skies agreements and joint military drills that routinely build confidence between rival powers. The fact that the U.S. and China are strategic competitors shouldn’t cause Washington to overreact to China’s attempts to improve its covert knowledge. There’s certainly good reason to strengthen counterintelligence activity and even attempt to turn some double agents (hopefully with more care than was applied in the case of Katrina Leung). But that shouldn’t change the fact that open societies ought to be rather relaxed about the fact they leak information through their pores. I have any number of problems with that argument and I’ll try to list just a few of them. First, isn’t that actually an argument for considerable openness in international relations, something I agree with? The enormous amount of secret information maintained by the U. S. government is suggestive of bad intentions. All of the official anger at Julian Assange is based on that secret information and what it mostly revealed was that our government does not have good intentions. If Mr. Fickling is right, we should be holding tickertape parades for Assange. That we are not suggests he’s wrong. Second, the analogy to Germany is incredibly weak. Not only is Germany almost completely disarmed where China ia actively building up its military strength, we’ve been pursuing German foreign policy interests for the better part of the last century. What does Germany have to worry about in us? A reunified Germany, the euro, political union in Europe, and NATO expansion are all much more in Germany’s interest than they are ours. If we’d actually been pursuing our own interests, none of those things would have happened. Third, since trust is a two-way street doesn’t it suggest that we should have just as aggressive a campaign of clandestine operations against China as they have against us? I don’t recall outcry over American downing of Chinese aircraft, American hacking of Chinese government facilities and companies, or American scholars found to be agents of the U. S. government. Maybe we’re just better at keeping secrets than the Chinese but, frankly, I doubt it. Fourth, knowledge and trust are not synonymous. It is simply not possible to know how much you don’t know. Consequently, there will always be a basis for suspicion. That the Chinese government does not trust us is not only an indication that we are not trustworthy but that the Chinese government is not trustworthy. Therefore in summary I’d say that official secrets are bad but sometimes necessary and that penetration of official secrets by the Chinese government or anyone else, notional friend or hypothetical enemy, is always bad. The graphic at the top of this post, produced from the work of data scientist Deniz Kahramaner, puts meat on the bones displayed in the quoted passage. It should be observed, however, that there is a fallacy lurking in the heart of it. Simply because you work for a tech company does not mean you’re a programmer. To take one extreme example, Amazon is a tech company but Jeff Bezos isn’t a programmer. 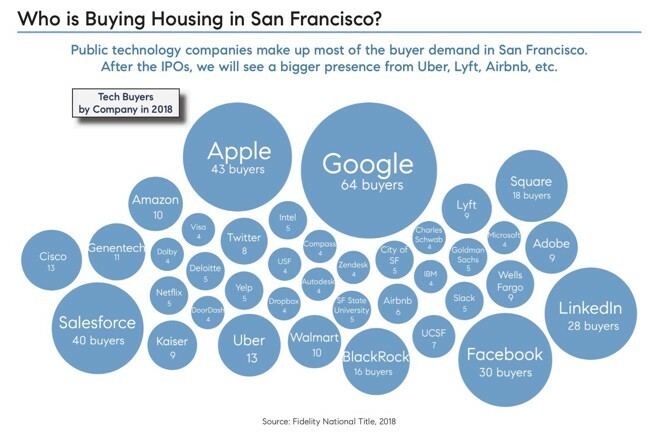 While I have little doubt that half of those buying property in San Francisco work for tech companies, I seriously doubt that they’re programmers. Based on the graphic above 64 Google employees have purchased property in San Francisco. Based on published information something between 25% and 45% of Google’s roughly 100,000 employees are programmers. To conclude that 64 Google programmers bought property you’d need to decide that Google programmers bought San Francisco property significantly in excess of the proportion of Google’s employees they represent. I suspect it’s the opposite and most of the Google employees buying property in San Francisco are managers rather than programmers. That’s a problem in dealing with small datasets. It’s easy to draw wrong conclusions. I only have a few additional observations to make about the article. First, let’s not subsidize San Francisco. Its business model is not one that those of us who don’t live there should support. When the Big One hits, San Franciscans are completely capable of rebuilding without help from the rest of us. Finally, that business model is doomed anyway. Either politics or nature will make it untenable. Over the period of the last 40 years we have made a series of unforced errors with respect to China. It’s not too late for us to reverse course. We shouldn’t kid ourselves into thinking there won’t be winners and losers by doing so. The losers will be everyone who has benefited by our terrible decisions and the winners will be those who have lost by them. IMO that wouldn’t be such a bad thing. But today’s winners are extremely powerful and want us to stay on the same self-destructive course. And I’ve said this before. we don’t need to change China’s behavior. We need to change our own. Something else about which many people are unaware. Ernest Hemingway was a member of a movement referred to as “Muscular Christianity”, at least for a time. It’s been around since the 19th century. Sinclair Lewis parodied it in Elmer Gantry. Because the United States’ 18th-century founders were rational, empirical, inquisitive pursuers of evidence-based improvement, they placed in the Constitution’s second section after the preamble a requirement for a census. And the 14th Amendment stipulates the required actual enumeration, every 10 years, of “the whole number” of people residing in the country. From 1820 (when Congress wanted “foreigners not naturalized” to be counted) through 1950, the census almost always included a citizenship question, and in 2018 Commerce Secretary Wilbur Ross decided that the 2020 “short-form” questionnaire, the one that goes to every household, should include one. Ross has testified that he was “responding solely” to a Justice Department request for the question to provide data helpful to enforcement of the Voting Rights Act (VRA) of 1965. There are actually multiple questions to be considered, as Mr. Will notes. Does the Census Bureau have the legal authority to put a question about citizenship on the federal census? Does it matter that the Secretary of Commerce lied about the deliberations regarding it? Do the motives of the Trump Administration restrict it from doing something it otherwise has the legal authority to do? My answers to those questions are yes, yes, and no. The Census Bureau has that authority because the Congress gave it the authority. The Congress should impeach Mr. Mills for lying to it. And imputedly bad motives do not restrict the Trump Administration from doing something it otherwise has the authority to do. The Congress has been wrong in granting sweeping latitude and authority to executive branch agencies in matters for which they and not the executive branch have responsibility. The members of Congress need to do their own damned jobs. While the discussion surrounding the Justice Department’s release of their redacted version of the Mueller report rightly focused on the substantive issues of the investigation, many of my Twitter feed were also complaining that it was released as a non-searchable PDF file. Much of the discussion focuses on the document we’ve seen not being Section 508 compliant. Section 508 of the Rehabilitation Act (29 U.S.C. § 794d) requires all federal agencies to maintain and use systems that are accessible to people with disabilities. Ahem. Speaking as someone who has actually overseen Section 508 compliance, there are pretty good reasons that the document we’ve seen was not compliant. Even applying the most rigorous standards, in order to ensure compliance your best strategy is to use a specialist. 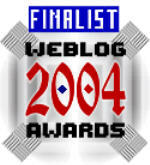 There are organizations that specialize in review and certification of Section 508 compliance. It would have taken weeks or even months just to let the contract for that. I have little doubt such a delay would have been seen as proof positive of evil intent. Section 508 compliance of the redacted version of the Mueller report is probably the least of our problems. That having been said what would we have if federal agencies failed to comply with the law and even their own regulations? We’d have precisely what we have now.